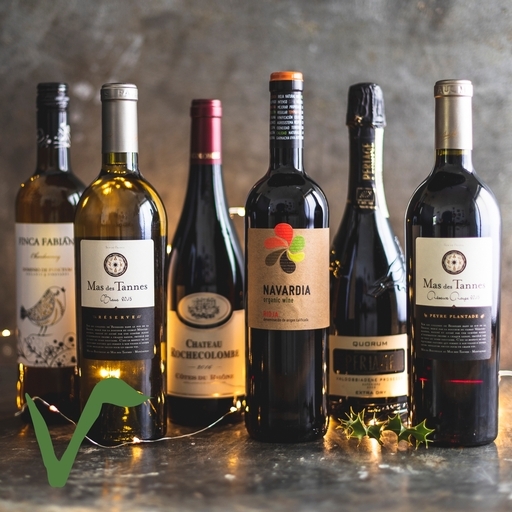 Six bottles of organic wine with impeccable credentials, specially chosen to complement all the flavours of Christmas. Whites are award-winning Mas des Tannes Reserve blanc and crisp Finca Fabian blanco. For your reds, darkly fruity Mas des Tannes Reserve rouge and a Côtes du Rhône blend from Château Rochecolombe. And for something fizzy, Perlage Quorum Prosecco. Mas des Tannes Réserve blanc 75cl: 70% Grenache blanc & 30% Chardonnay, Alcohol 13.5%, sulphites 65mg/l, produced in France, Suitable for vegans. Mas des Tannes Reserve rouge 75cl: 55% Cabernet Sauvignon, 35% Grenache & 10% Mourvèdre, Alcohol 14%, sulphites 54mg/l, produced in France, Suitable for vegans. Finca fabian blanco 75cl: 100% Chardonnay, Alcohol 13%, sulphites 60mg/l, produced in Spain, Suitable for vegans. Perlage Quorum prosecco extra dry 75cl: Glera (Prosecco), Alcohol 11.5%, sulphites 88mg/l, produced in Italy, Suitable for vegans. Chateau Rochecolombe Cotes du Rhone 75cl: 60% Grenache & 40% Syrah, Alcohol 14%, sulphites 20mg/l, produced in France, Suitable for vegans.